G7 is a method of calibrating a printer to a common visual appearance, using the process described in ANSI/CGATS Technical Report TR015. After calibration, however, characterization is still required. In the digital print world (with few exceptions) each unique printer, ink, media, print mode combination must be characterized to produce a custom profile. Whether using solvent or aqueous inkjet, toner, dye sublimation, or even a conventional press with a non-standard ink set, custom ICC profiles are necessary to produce accurate color matches. G7 calibrates a printer to a common appearance by defining a common relationship between all the colors a particular device can reproduce. When the relationship between colors is the same in prints from different printers, even if discrete colors are colorimetrically very different, we perceive a common visual appearance. ​This is because the brain does not analyze discrete colors like a colorimeter; it sees instead the relationship between colors that constitute the complete image. This is the basis for the Perceptual (or photographic) rendering intent defined in the ICC specification; and, why G7 by itself works so well for achieving a common visual appearance with photographic images, but not as well for spot colors and solid color graphics. G7 creates a set of CMYK curves for the printer such that the C, M and Y curves yield ratios that produce the same perceptual neutral grayscale for the unique media Dmin and ink Dmax of the printer; this fixes the relationship of all the other colors. These curves become the 1D lookup tables (LUTs) stored in the ICC profile. But, the resulting CMYK values will be different printer-to-printer; so, even after G7 calibration, some method must exist to translate the printer-specific CMYK values to a universal color space (like CIELAB). This is where the profile comes in, or specifically the 3D color lookup tables (CLUTs) inside the profile. In short, the color relationship is fixed through G7 calibration, and then the ICC profile is created to translate printer-specific color space to a universal color space (called Profile Connection Space). This process, calibration then characterization, insures accurate reproduction of discrete colors. The 3D CLUTs inside the ICC profile come in pairs, called A2B and B2A. There are three pairs: Colorimetric; Perceptual (or photographic); and, Saturation. These are also referred to as Rendering Intents, and the most common and well-defined is Colorimetric. Why three? Profile Connection Space, or PCS, is typically based on CIELAB, and the color gamut of CIELAB (which represents human visual response) is much larger than that of any printer. This means many colors exist that cannot be accurately reproduced on the printer. The A2B CLUTs map printer colors to PCS, so every printer color will have a corresponding PCS color. The B2A CLUTs, on the other hand, map PCS colors to printer-specific colors, so many PCS colors in these tables will not have corresponding printer colors. When the ICC profile is built, PCS colors that fall outside the color gamut of the printer (out-of-gamut colors) are mapped to the closest in-gamut color. But, because there are different methods of performing out-of-gamut color mapping (depending on the type of image being printer) there are different rendering intents. Colorimetric is most common, as it prints all in-gamut colors accurately, and attempts to maintain hue and lightness for out-of-gamut colors (at the expense of saturation); this works well for most types of images. The Perceptual rendering intent, best suited to photographic images, artificially compresses the PCS gamut to better fit that of the printer, maintaining the relationship of all colors while sacrificing colorimetric accuracy. The Saturation intent, best for business presentations and solid color graphics, attempts to maintain saturation and lightness, at the expense of hue. The accuracy of the color lookup tables, combined with the algorithms used to map out-of-gamut colors, is what differentiates one profile from another in terms of quality. The Color Management System, or CMS used to apply the profile at print time also plays a critical role in the quality of the color matches and overall color reproduction achieved. Another important reason for using an ICC profile is to apply Gray Component Replacement, or GCR. By default, process color printing is actually a three-color process: C, M and Y (the inverse of R, G and B). When G7 printer calibration is performed, CMY calibration is the principal focus. While there is a K curve, its purpose is to determine the relationship between CMY process gray and K-only gray. G7 does not specify how to integrate K with CMY, but the curves generated can be used to define the CMY→K relationship. This is important for both GCR and Under Color Addition (UCA). 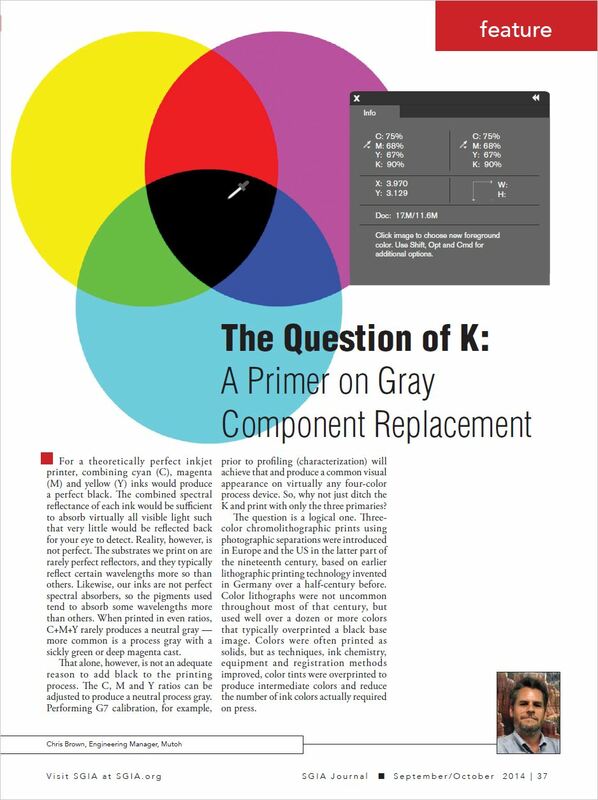 To implement K via GCR, the ICC profiling software must first remove an equivalent ratio of C, M and Y, representing the achromatic component of the CMY color in question. Using the G7 calibration curves, the profiling software can determine the density equivalent of K to replace the achromatic component by matching the CMY grayscale L* to the identical L* of K. It can also use the CMY curves to determine how best to compensate for any chromatic bias in the K ink, by adding back a small amount of C, M or Y ink such that the resulting CMYK color is a colorimetric match to the original CMY color (after accounting for any change in L*). Determining the variables of the GCR function, and how best to leverage the (typically higher) density of K vs. CMY to yield a wider dynamic range, better contrast and more saturated colors is a function of the ICC profiling software. This is also the key to how G7 can help maintain consistent color reproduction over time, and why calibration is so important to process control. It does more than simply remove the inherent color cast of the printer prior to characterization; it maintains the relationship between CMY process gray and K, which ensures the validity of the GCR function (and in turn the validity of the ICC profile). Calibration establishes the CMY→K relationship prior to constructing the profile, and when color drifts recalibration can fix that relationship without re-profiling, saving valuable shop time.